The Radial Engineering ProRMP is a 100% passive re-amplifier that takes a prerecorded track and re-amplifies it through a guitar amp or effects pedal creating new and exciting tones. Re-amping has been the "secret weapon" for countless recordings by the biggest names in the business and the process is often used on guitars, bass, keyboards, percussion, and even voice to create new textures! 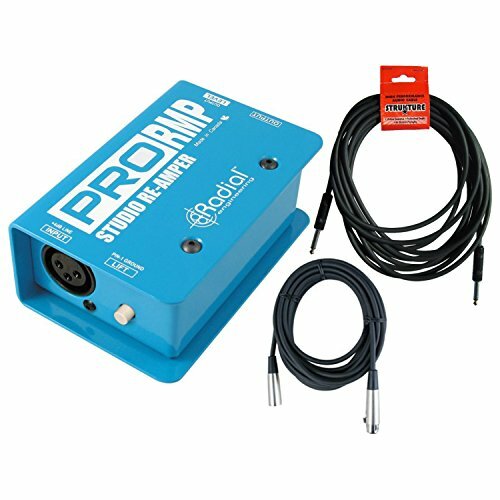 Plug and play and easy to use, the ProRMP Studio Direct Box connects from the recorder to your amp and effects units and does all the impedance matching for you. Just adjust the level to suit! The magic behind the Radial Engineering ProRMP's great tone is a custom-wound transformer that at once converts the balanced Low-Z source to a Hi-Z input for your amp while also acting as an electrical isolator to eliminate troublesome ground loops that can often cause buzz and hum in the sound.